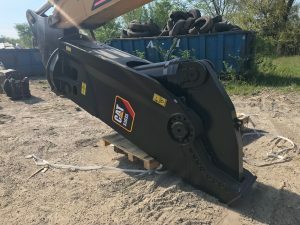 Caterpillar Work Tools has expanded its range of excavator attachments with three new scrap-shear models—S3015, S3025, and S3035—which build on the company’s demolition-and scrap processing technology experience. 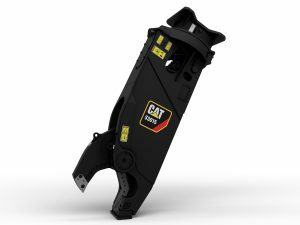 Designed for hydraulic excavators with operating weights between 8 and 40 metric tons, these new Cat®shears feature optimum force-to-weight ratios that yield faster cycle times and more cuts per hour, compared with predecessor models. The new shears join the rotating models—S3050, S3070, and S3090—as well as the straight versions—S2050, S2070, and S2090—in the Cat scrap-shear range. These robust new shears feature a dual-offset apex-jaw design, resulting in increased cutting performance and efficiency. The new patent-pending bolt-on piercing tip on the upper jaw further enhances productivity when piercing is required and protects the moving jaw and shielding parent metal from wear as the moving jaw travels through the lower jaw. Structural reinforcements more effectively distribute the shear’s cutting forces, and the apex-jaw design, coupled with a larger jaw opening, results in greater cutting strength, especially when cutting profiles. The powerful reverse cylinder is fully protected and allows a slim profile that improves visibility and maneuverability in tight spaces. The knives and guide blades have four cutting surfaces that can be rotated before replacement is necessary. A heavy-duty pivot group can be tightened with standard tooling to keep the jaws aligned as wear occurs. The new Cat shears are maintenance friendly and feature field-serviceable swivel and pivot group, which will reduce downtime. The operator can adjust the side play in the field without the need for special tooling by only tightening the pin. Further, greasing the shear, including stick cylinder and boom pin, can be done from ground level, making this work safer. The S2000/S3000 Series are manufactured from alloy steel having superior yield and tensile strength properties. These qualities contribute to longer overall life. Knife maintenance, wear-plate replacement, and tip build-up can be addressed quickly and easily. The S2000/S3000 Series fits Cat excavators, as well as other brands, with operating weights from 8 tons to 85 tons plus. Caterpillar supports its work tools with a comprehensive range of pre- and after-sales services that include advice about work tool selection, operator training, equipment management, and a range of financial and insurance products. S3015 Boom: 7- 10t / 15,500 – 22,100 lb. Stick: 12- 18t / 26,500 – 40,000 lb 400 mm / 16 in. S3025 Boom: 11 – 15t / 24,250 – 33,000 lb. Stick: 20 – 25t / 44,000 – 55,000 lb 458 mm / 18 in. S3035 Boom: 16 – 20t / 25,250 – 44,000 lb. Stick: 24 – 36t / 53,000 – 79,500 lb 560 mm / 22 in.